Looking for a completely original wrapper and bar? 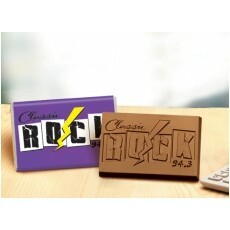 Design your own colorful, full-custom logo wrapper and your own unique engraving on the Belgian milk or dark chocolate. Bars measure 2" x 3" (.75 oz). Size : 2" x 3" (.75 oz). 2" x 3" (.75 oz).